P1253. 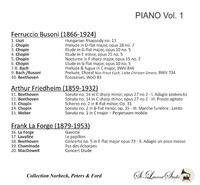 FERRUCCIO BUSONI (Busoni’s complete recorded discography), ARTHUR FRIEDHEIM, FRANK La FORGE: Legendary 78rpm Recordings. (Canada) St Laurent Studio YSL 78-424, recorded 1911-22. Transfers by Yves St Laurent. 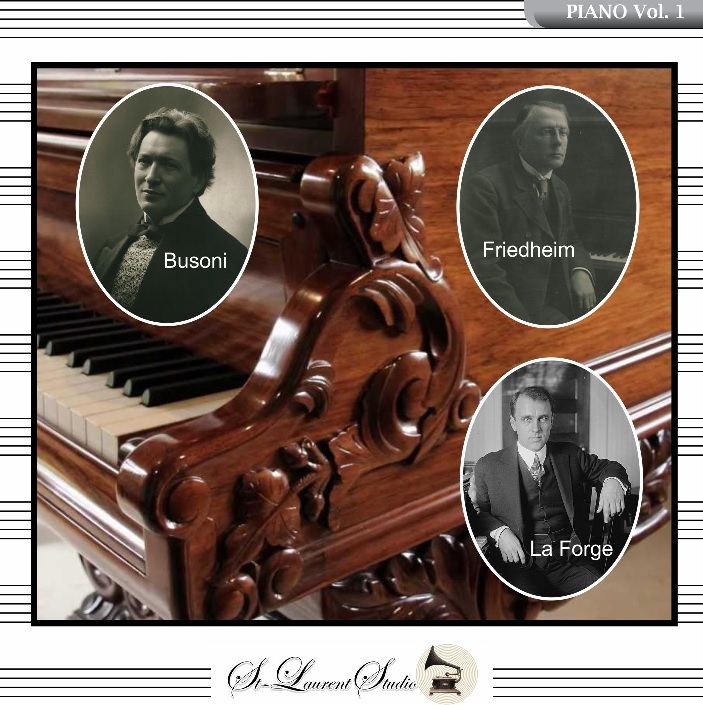 “Ferruccio Busoni developed a virtuoso keyboard technique that is in itself the stuff of legend. From an early age, Busoni pursued a serious interest in the music of J.S. Bach, Mozart, Beethoven, and Liszt. Although Busoni's reputation as a piano virtuoso of the first rank was established in Europe by the end of the 1880s, he first made his mark as an editor of Bach's keyboard music. While today these editions are regarded as among the most intrusive and heavily marked Bach scores ever made, Busoni's marginal remarks about Bach's thought processes and the analytic value of these comments influenced Bach scholars and composers for generations. “By the age of six, Arthur Friedheim was being taught piano by Carl Siecke, a pupil of Anton Rubinstein, whilst his début at the age of nine was with a piano concerto by John Field. At fourteen he continued lessons in composition and harmony with Siecke but began taking tuition in piano from Anton Rubinstein. Four years later, in August 1878, Friedheim arrived in Weimar to study with Franz Liszt, becoming not only a pupil of the great master but also his close friend and secretary. After Liszt’s death Friedheim lived in Leipzig from where he toured Europe (including Finland) and Russia promoting Liszt’s compositions, also occasionally appearing as a conductor. His first tour of England was in 1889, where he was appointed professor at the Royal Manchester College of Music, a post he held until 1904. 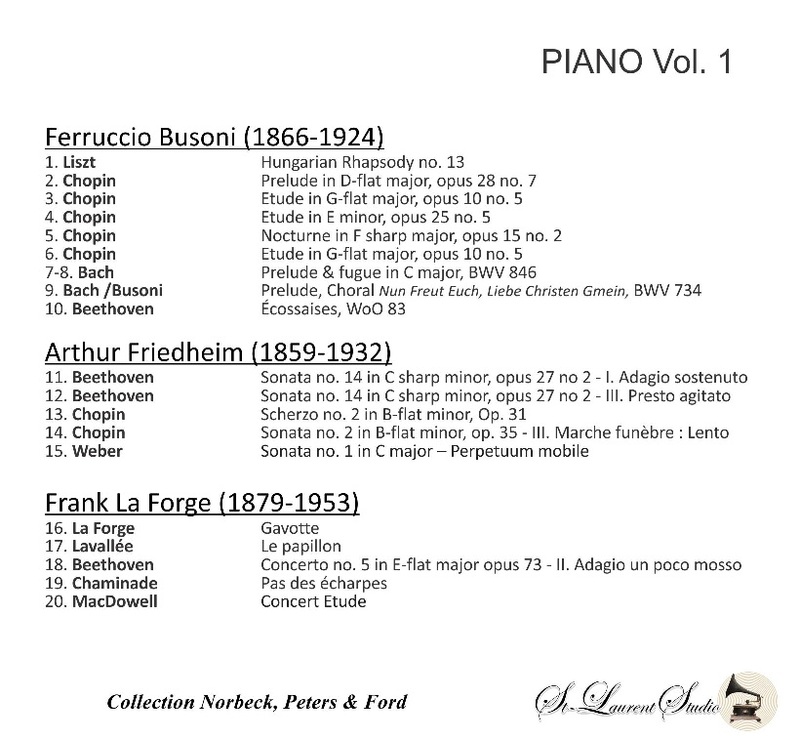 Friedheim’s New York début was in 1891 with Beethoven’s ‘Emperor’ Concerto, and during the first season at the newly opened Carnegie Hall in April 1891 he gave three recitals within a week. Friedheim toured both Europe and America before settling in New York around 1915; upon the death of Mahler in 1911 he was offered the post of conductor of the New York Philharmonic Orchestra, but refused it. He gave a few large recitals in Toronto in 1923 and in New York in 1924 and 1925.